This article is about the U.S. Representative from Georgia. For other people of the same name, see John Lewis (disambiguation). John Robert Lewis (born February 21, 1940) is an American politician and civil rights leader. He is the U.S. Representative for Georgia's 5th congressional district, serving in his 17th term in the House, having served since 1987, and is the dean of the Georgia congressional delegation. His district includes the northern three-fourths of Atlanta. Lewis, who as chairman of the Student Nonviolent Coordinating Committee (SNCC) was one of the "Big Six" leaders of groups who organized the 1963 March on Washington, played many key roles in the Civil Rights Movement and its actions to end legalized racial segregation in the United States. He is a member of the Democratic Party leadership in the U.S. House of Representatives and has served as a Chief Deputy Whip since 1991 and Senior Chief Deputy Whip since 2003. Lewis has been awarded many honorary degrees and is the recipient of numerous awards from eminent national and international institutions, including the highest civilian honor of the United States, the Presidential Medal of Freedom. John Lewis was born in Troy, Alabama, the third son of Willie Mae (née Carter) and Eddie Lewis. His parents were sharecroppers. Lewis grew up in Pike County, Alabama. He has several siblings, including brothers Edward, Grant, Freddie, Sammy, Adolph, and William, and sisters Ethel, Rosa, and Ora. At the age of six, Lewis had seen only two white people in his life. He was educated at the Pike County Training High School, Brundidge, Alabama, and also American Baptist Theological Seminary and at Fisk University, both in Nashville, Tennessee, where he became a leader in the Nashville sit-ins. While a student, he was invited to attend nonviolence workshops held in the basement of Clark Memorial United Methodist Church by the Rev. James Lawson and Rev. Kelly Miller Smith. There, Lewis and many of his fellow students became dedicated adherents to the discipline and philosophy of nonviolence, which he still practices today. The Nashville sit-in movement was responsible for the desegregation of lunch counters in downtown Nashville. Lewis was arrested and jailed many times in the nonviolent movement to desegregate the downtown area of the city. Afterwards, he participated in the Freedom Rides sponsored by the Congress of Racial Equality (CORE), led by James Farmer, and ultimately became a national leader in the movement for civil rights and respect for human dignity. In an interview, John Lewis said, "I saw racial discrimination as a young child. I saw those signs that said 'White Men, Colored Men, White Women, Colored Women'. ... I remember as a young child with some of my brothers and sisters and first cousins going down to the public library trying to get library cards, trying to check some books out, and we were told by the librarian that the library was for whites only and not for 'coloreds'." During a childhood trip to Buffalo, New York, Lewis saw for the first time black men and white men working together, desegregating water fountains, and began to believe the dream of equality was more than just a dream. Lewis listened to Dr. Martin Luther King, Jr. and Rosa Parks on the radio, and he and his family supported the Montgomery Bus Boycott. Lewis met Parks in 1957 when he was 17, and he met King the following year. John Lewis was the youngest of the "Big Six" leaders as chairman of the Student Nonviolent Coordinating Committee (SNCC) from 1963 to 1966, some of the most tumultuous years of the Civil Rights Movement. During his tenure, SNCC opened Freedom Schools, launched the Mississippi Freedom Summer, and organized some of the voter registration efforts during the 1965 Selma voting rights campaign. As the chairman of SNCC, Lewis had written a speech in reaction to the Civil Rights Bill of 1963. He denounced the bill because it didn't protect African Americans against police brutality or provide African Americans with the right to vote. Lewis graduated from the American Baptist Theological Seminary in Nashville and then received a bachelor's degree in Religion and Philosophy from Fisk University. As a student, he was very dedicated to the Civil Rights Movement. He organized sit-ins at segregated lunch counters in Nashville and took part in many other civil rights activities as part of the Nashville Student Movement. He was instrumental in organizing student sit-ins, bus boycotts and nonviolent protests in the fight for voter and racial equality. In 1960, Lewis became one of the 13 original Freedom Riders. There were seven whites and six blacks who were determined to ride from Washington, D.C., to New Orleans in an integrated fashion. At that time, several states of the old Confederacy still enforced laws prohibiting black and white riders from sitting next to each other on public transportation. The Freedom Ride, originated by the Fellowship of Reconciliation and revived by James Farmer and CORE, was initiated to pressure the federal government to enforce the Supreme Court decision in Boynton v. Virginia (1960) that declared segregated interstate bus travel to be unconstitutional. In the South, Lewis and other nonviolent Freedom Riders were beaten by angry mobs, arrested at times and taken to jail. When CORE gave up on the Freedom Ride because of the violence, Lewis and fellow activist Diane Nash arranged for the Nashville students to take it over and bring it to a successful conclusion. In 1963, when Chuck McDew stepped down as SNCC chairman, Lewis, one of the founding members of SNCC, was quickly elected to take over. Lewis's experience at that point was already widely respected. His courage and his tenacious adherence to the philosophy of reconciliation and nonviolence made him emerge as a leader. By this time, he had been arrested 24 times in the nonviolent struggle for equal justice. He held the post of chairman until 1966. In 1963, as chairman of SNCC Lewis was named one of the "Big Six" leaders who were organizing the March on Washington, the occasion of Dr. King's celebrated "I Have a Dream" speech, along with Whitney Young, A. Philip Randolph, James Farmer and Roy Wilkins. Lewis also spoke at the March. Discussing the occasion, historian Howard Zinn wrote: "At the great Washington March of 1963, the chairman of the Student Nonviolent Coordinating Committee (SNCC), John Lewis, speaking to the same enormous crowd that heard Martin Luther King's I Have a Dream speech, was prepared to ask the right question: 'Which side is the federal government on?' That sentence was eliminated from his speech by organizers of the March to avoid offending the Kennedy Administration. But Lewis and his fellow SNCC workers had experienced, again and again, the strange passivity of the national government in the face of Southern violence." At 23 he was the youngest speaker that day and is the last remaining living speaker. In 1964, Lewis coordinated SNCC's efforts for "Mississippi Freedom Summer," a campaign to register black voters across the South. The Freedom Summer was an attempt to expose college students from around the country to the perils of African-American life in the South. Lewis traveled the country encouraging students to spend their summer break trying to help people in Mississippi, the most recalcitrant state in the union, to register and vote. Lewis became nationally known during his prominent role in the Selma to Montgomery marches when, on March 7, 1965 – a day that would become known as "Bloody Sunday" – Lewis and fellow activist Hosea Williams led over 600 marchers across the Edmund Pettus Bridge in Selma, Alabama. At the end of the bridge, they were met by Alabama State Troopers who ordered them to disperse. When the marchers stopped to pray, the police discharged tear gas and mounted troopers charged the demonstrators, beating them with night sticks. Lewis's skull was fractured, but he escaped across the bridge to Brown Chapel, the movement's headquarter church in Selma. Before Lewis could be taken to the hospital, he appeared before the television cameras calling on President Johnson to intervene in Alabama. Lewis bears scars from the incident on his head that are still visible today. At 21 years old, Lewis was the first of the Freedom Riders to be assaulted while in Rock Hill, South Carolina. He tried to enter a whites-only waiting room and two white men attacked him, injuring his face and kicking him in the ribs. Nevertheless, only two weeks later Lewis joined a Freedom Ride that was bound for Jackson. "We were determined not to let any act of violence keep us from our goal. We knew our lives could be threatened, but we had made up our minds not to turn back," Lewis said recently in regard to his perseverance following the act of violence. In an interview with CNN during the 40th anniversary of the Freedom Rides, Lewis recounted the sheer amount of violence he and the 12 other original Freedom Riders endured. In Anniston, Alabama, the bus was fire-bombed after Ku Klux Klan members deflated its tires, forcing it to come to a stop. Lewis, however, was not present on that particular day. In Birmingham, the Riders were mercilessly beaten, and in Montgomery, an angry mob met the bus, and Lewis was hit in the head with a wooden crate. "It was very violent. I thought I was going to die. I was left lying at the Greyhound bus station in Montgomery unconscious," said Lewis, remembering the incident. The original intent of the Freedom Rides was to test the new law that banned segregation in public transportation. It also exposed the passivity of the government regarding violence against citizens of the country who were simply acting in accordance to the law. The federal government had trusted the notoriously racist Alabama police to protect the Riders, but did nothing itself, except to have FBI agents take notes. The Kennedy Administration then called for a cooling-off period, a moratorium on Freedom Rides. Lewis had been imprisoned for forty days in the Mississippi State Penitentiary in Sunflower County, Mississippi, after participating in a Freedom Riders activity in that state. In February 2009, forty-eight years after he had been bloodied by the Ku Klux Klan during civil rights marches, Lewis received an apology on national television from a white southerner, former Klansman Elwin Wilson. In January 1977, incumbent Democrat U.S. Congressman Andrew Young of Georgia's 5th congressional district resigned in order to become the U.S. Ambassador to the U.N. under President Jimmy Carter. In the March 1977 open primary, Atlanta City Councilman Wyche Fowler, Jr. ranked first with 40% of the vote, failing to reach the 50% threshold to win outright. Lewis ranked second with 29% of the vote. In the April election, Fowler defeated Lewis 62%–38%. After his unsuccessful bid for Congress in 1977, he accepted a position with the Carter administration as associate director of ACTION, responsible for running the VISTA program, the Retired Senior Volunteer Program, and the Foster Grandparent Program. He held that job for two and a half years, resigning as the 1980 election approached. In 1981, Lewis was elected to the Atlanta City Council. After nine years as a member of the U.S. House of Representatives, Fowler gave up the seat to make a successful run for the U.S. Senate. Lewis decided to run for the 5th district again. In the August Democratic primary, where a victory was considered tantamount to election, State Representative Julian Bond ranked first with 47%, just three points shy of winning outright. Lewis earned 35% in second place. In the run-off, Lewis pulled an upset against Bond, defeating him 52% to 48%. The race was said to have "badly strained relations in Atlanta's black community". Lewis was "endorsed by the Atlanta newspapers and a favorite of the white liberal establishment", with his victory coming from his strong polling among white voters (a minority in the district). During the campaign, he ran advertisements accusing Bond of corruption, implying that Bond used cocaine, and suggesting that Bond had lied about his civil rights activism. In the November general election, Lewis defeated Republican Portia Scott 75% to 25%. John Lewis has been reelected 14 times. He has dropped below 70 percent of the vote only twice. In 1994, he defeated Republican Dale Dixon by a 38-point margin, 69%–31%. He even ran unopposed in 1996 and from 2004 to 2008, 2014, and again in 2018. He was challenged in the Democratic primary just twice: in 1992 and 2008. In 1992, he defeated State Representative Mable Thomas 76%–24%. In 2008, Thomas decided to challenge Lewis again, as well as the Reverend Markel Hutchins. Lewis defeated Hutchins and Thomas 69%–16%-15%. On May 5, 2014, Lewis delivered the keynote address at the commencement exercises for the School of Visual Arts (SVA), urging the graduating artists to use their talents to fight injustice, saying, "You have a mandate to get out and disturb the order of things." SVA honored Lewis with an Honorary Doctorate of Fine Arts. In 2017, Lewis delivered the keynote addresses at the commencement exercises for both Bard College and Bank Street College of Education. Lewis represents Georgia's 5th congressional district, one of the most consistently Democratic districts in the nation. Since its formalization in 1845, the district has been represented by a Democrat for all but eleven years. Lewis is one of the most liberal members of the House, and one of the most liberal congressmen ever to represent a district in the Deep South. He has been categorized as a "Hard-Core Liberal" by On the Issues. The Washington Post described Lewis in 1998 as "a fiercely partisan Democrat but ... also fiercely independent." Lewis characterized himself as a strong and adamant liberal. The Atlanta Journal-Constitution said Lewis was the "only former major civil rights leader who extended his fight for human rights and racial reconciliation to the halls of Congress." The Atlanta Journal-Constitution also said that to "those who know him, from U.S. senators to 20-something congressional aides," he is called the "conscience of Congress." Lewis has cited former Florida Senator and Congressman Claude Pepper, a staunch liberal, as being the colleague that he has most admired. Lewis has spoken out in support of gay rights and national health insurance. Lewis opposed the U.S. waging of the 1991 Gulf War, and the 2000 trade agreement with China that passed the House. He opposed the Clinton administration on NAFTA and welfare reform. After welfare reform passed, Lewis was described as outraged; he said, "Where is the sense of decency? What does it profit a great nation to conquer the world, only to lose its soul?" In 1994, when Clinton was considering invading Haiti, Lewis, in contrast to the Congressional Black Caucus as a whole, opposed armed intervention. When Clinton did send troops to Haiti, Lewis called for supporting the troops and called the intervention a "mission of peace". In 1998, when Clinton was considering a military strike against Iraq, Lewis said he would back the president if American forces were ordered into action. In 2001, three days after the September 11 attacks, Lewis voted to give Bush authority to retaliate in a vote that was 420–1; Lewis called it probably one of his toughest votes. In 2002, he sponsored the Peace Tax Fund bill, a conscientious objection to military taxation initiative that had been reintroduced yearly since 1972. Lewis was a "fierce partisan critic of President Bush" and the Iraq war. The Associated Press said he was "the first major House figure to suggest impeaching George W. Bush," arguing that the president "deliberately, systematically violated the law" in authorizing the National Security Agency to conduct wiretaps without a warrant. Lewis said, "He is not king, he is president." Lewis draws on his historical involvement in the Civil Rights Movement as part of his politics. He "makes an annual pilgrimage to Alabama to retrace the route he marched in 1965 from Selma to Montgomery – a route Lewis has since had declared part of the Historic National Trails program. That trip has become one of the hottest tickets in Washington among lawmakers, Republican and Democrat, eager to associate themselves with Lewis and the movement. 'We don't deliberately set out to win votes, but it's very helpful,' Lewis said of the trip.". In recent years, however, Faith and Politics Institute has drawn criticism for selling seats on the trip to lobbyists for at least $25,000 each. According to the Center for Public Integrity, even Lewis said that he would feel "much better" if the institute's funding came from churches and foundations instead of corporations. On June 3, 2011, the House passed a resolution 268–145, calling for a withdrawal of the United States military from the air and naval operations in and around Libya. Lewis voted against the resolution. In January 2001, Lewis boycotted the Inauguration of George W. Bush by staying in his Atlanta district. He did not attend the swearing-in because he didn't believe Bush was the true elected president. In March 2003, Lewis spoke to a crowd of 30,000 in Oregon during an anti-war protest before the start of the Iraq War. He was arrested in 2006 and 2009 and outside the Sudan embassy in protest against the genocide in Darfur. He was one of eight U.S. Representatives, from six states, arrested while holding a sit-in near the west side of the U.S. Capitol building, to advocate for immigration reform. The lawmakers' participation and subsequent arrest in the protest occurred despite the fact that the 2013 government shutdown was going on at the time. Lewis also led the 2016 House Democrats sit-in demanding that the House take action on gun control in the wake of the Orlando nightclub shooting and the failure of the United States Senate to act. Lewis speaks during the final day of the 2008 Democratic National Convention in Denver, Colorado. At first, Lewis supported Hillary Clinton, endorsing her presidential campaign on October 12, 2007. On February 14, 2008, however, he announced he was considering withdrawing his support from Clinton and might instead cast his superdelegate vote for Barack Obama: "Something is happening in America and people are prepared and ready to make that great leap." Ben Smith of Politico said that "it would be a seminal moment in the race if John Lewis were to switch sides." On February 27, 2008, Lewis formally changed his support and endorsed Obama. After Obama clinched the Democratic nomination for president, Lewis said "If someone had told me this would be happening now, I would have told them they were crazy, out of their mind, they didn't know what they were talking about ... I just wish the others were around to see this day. ... To the people who were beaten, put in jail, were asked questions they could never answer to register to vote, it's amazing." Despite switching his support to Obama, Lewis' support of Clinton for several months led to criticism from his constituents. One of his challengers in the House primary election set up campaign headquarters inside the building that served as Obama's Georgia office. In October 2008, Lewis issued a statement criticizing the campaign of John McCain and Sarah Palin and accusing them of "sowing the seeds of hatred and division" in a way that brought to mind the late Gov. George Wallace and "another destructive period" in American political history. McCain said he was "saddened" by the criticism from "a man I've always admired," and called on Obama to repudiate Lewis's statement. Obama responded to the statement, saying that he "does not believe that John McCain or his policy criticism is in any way comparable to George Wallace or his segregationist policies." Lewis later issued a follow-up statement clarifying that he had not compared McCain and Palin to Wallace himself, but rather that his earlier statement was a "reminder to all Americans that toxic language can lead to destructive behavior." If you ask me whether the election ... is the fulfillment of Dr. King's dream, I say, "No, it's just a down payment." There's still too many people 50 years later, there's still too many people that are being left out and left behind. On June 22, 2016, House Democrats, led by Lewis and Massachusetts Representative Katherine Clark, began a sit-in demanding House Speaker Paul Ryan allow a vote on gun-safety legislation in the aftermath of the Orlando nightclub shooting. Speaker pro tempore Daniel Webster ordered the House into recess, but Democrats refused to leave the chamber for nearly 26 hours. In 1988, the year after he was sworn into Congress, Lewis introduced a bill to create a national African American museum in Washington. The bill failed and for 15 years he continued to introduce it with each new congress, but each time it was blocked in the Senate, largely by Conservative, Southern Senator Jesse Helms. In 2002, Helms did not seek reelection, Lewis gained bipartisan support, and in 2003 President George W. Bush signed the bill to establish the museum, with the Smithsonian's Board of Regents to establish the location. The National Museum of African American History and Culture, located adjacent to the Washington Memorial, held its opening ceremony on September 25, 2016. On January 13, 2017, during an interview with NBC's Chuck Todd for Meet the Press, Lewis stated: "I don't see the president-elect as a legitimate president." He added, "I think the Russians participated in having this man get elected, and they helped destroy the candidacy of Hillary Clinton. I don't plan to attend the Inauguration. I think there was a conspiracy on the part of the Russians, and others, that helped him get elected. That's not right. That's not fair. That's not the open, democratic process." Trump replied on Twitter the following day, suggesting that Lewis should "spend more time on fixing and helping his district, which is in horrible shape and falling apart (not to [...] mention crime infested) rather than falsely complaining about the election results," and accusing Lewis of being "All talk, talk, talk – no action or results. Sad!" Trump's statement about Lewis' district was rated as "Mostly False" by PolitiFact, and he was criticized for attacking a civil rights leader such as John Lewis, especially one who was brutally beaten for the cause, and especially on Martin Luther King weekend. Senator John McCain acknowledged Lewis as “an American hero” but criticized him saying “this is not the first time that Congressman Lewis has taken a very extreme stand and condemned without any shred of evidence for doing so an incoming president of the United States. This is a stain on Congressman Lewis' reputation — no one else’s.” The New York Post noted that Lewis used the "same unfounded, cookie-cutter personal attacks against Republican after Republican". A few days later, Lewis said that he would not attend Trump's inauguration because he did not believe that Trump was the true elected president, like Bush in 2001. Since 1991, Lewis has been senior chief deputy whip in the Democratic caucus. Lewis's autobiography, Walking with the Wind: A Memoir of the Movement, co-written with Michael D'Orso, was published in 1998. His life is also the subject of a 2002 book for young people, John Lewis: From Freedom Rider to Congressman. In 2012, Lewis released Across That Bridge, written with Brenda Jones, to mixed reviews. Publishers Weekly's review said, "At its best, the book provides a testament to the power of nonviolence in social movements… At its worst, it resembles an extended campaign speech". In 2013, Lewis became the first member of Congress to write a graphic novel, with the launch of a trilogy titled March. The March trilogy is a black and white comics trilogy about the Civil Rights Movement, told through the perspective of civil rights leader and U.S. Congressman John Lewis. The first volume, March: Book One is written by Lewis and Andrew Aydin, illustrated and lettered by Nate Powell and was published in August 2013, the second volume, March: Book Two was published in January 2015 and the final volume, March: Book Three was published in August 2016. In an August 2014 interview, Lewis cited the influence of a 1958 comic book, Martin Luther King and the Montgomery Story, on his decision to adapt his experience to the graphic novel format. March: Book One became a number one New York Times bestseller for graphic novels and spent more than a year on the lists. March: Book One received an "Author Honor" from the American Library Association's 2014 Coretta Scott King Book Awards. Book One also became the first graphic novel to win a Robert F. Kennedy Book Award, receiving a "Special Recognition" bust in 2014. March: Book One was selected by first-year reading programs in 2014 at Michigan State University, Georgia State University, and Marquette University. March: Book Two was released in 2015 and immediately became both a New York Times and Washington Post bestseller for graphic novels. The release of March: Book Three in August 2016 brought all three volumes into the top 3 slots of the New York Times bestseller list for graphic novels for 6 consecutive weeks. The third volume was announced as the recipient of the 2017 Printz Award, the Coretta Scott King Award, the YALSA Award for Excellence in Nonfiction, the 2016 National Book Award in Young People's Literature, and the Sibert Medal at the American Library Association's annual Midwinter Meeting in January 2017. The March trilogy received the Carter G. Woodson Book Award in the Secondary (grades 7–12) category in 2017. In 2018, Lewis and Andrew Aydin co-wrote another graphic novel as sequel to the March series entitled Run. The graphic novel picks up the events in Lewis' life after the passage of the Civil Rights Act. The authors teamed with award-winning comic book illustrator Afua Richardson for the book, which was released in August 2018. Nate Powell, who illustrated March, also contributed to the art. Lewis met Lillian Miles at a New Year's Eve party hosted by Xernona Clayton. They married in 1968. Together, they had one son, named John-Miles. Lillian died on December 31, 2012. Lewis is a member of Phi Beta Sigma fraternity. Lewis is honored with the 1997 sculpture by Thornton Dial, The Bridge, at Ponce de Leon Avenue and Freedom Park, Atlanta. Two years later, in 1999, Lewis was awarded the Wallenberg Medal from the University of Michigan in recognition of his courageous lifelong commitment to the defense of civil and human rights. In that same year he received the Four Freedoms Award for the Freedom of Speech. In 2001, the John F. Kennedy Library Foundation awarded Lewis the Profile in Courage Award "for his extraordinary courage, leadership and commitment to civil rights." It is a lifetime achievement award and has been given out only twice, John Lewis and William Winter (in 2008).The next year he was awarded the Spingarn Medal from the NAACP. In 2006, he received the US Senator John Heinz Award for Greatest Public Service by an Elected or Appointed Official, an award given out annually by Jefferson Awards. In September 2007, Lewis was awarded the Dole Leadership Prize from the Robert J. Dole Institute of Politics at the University of Kansas. Lewis was the only living speaker from the March on Washington present on the stage during the inauguration of Barack Obama. Obama signed a commemorative photograph for Lewis with the words, "Because of you, John. Barack Obama." On November 17, 2010, Lewis was awarded the First LBJ Liberty and Justice for All Award, given to him by the Lyndon Baines Johnson Foundation, and the next year, Lewis was awarded the Presidential Medal of Freedom by President Barack Obama. On January 6, 2016, it was announced that a future United States Navy underway replenishment oiler would be named USNS John Lewis. On May 29, 2016, Lewis gave the Class of 2016 Commencement Address at Bates College, in Lewiston, Maine. 2013 : Honorary Doctor of Humane Letters from Judson College. 2014: Honorary Doctorate of Fine Arts from the School of Visual Arts. 2014: Honorary Bachelor of Arts from Lawrence University. 2015: Honorary Doctorate of Humane Letters from the McCourt School of Public Policy, Georgetown University. 2016: Honorary Doctorate of Humane Letters from New York University. On September 19, 2016, Rep. John Lewis was awarded the Liberty Medal at the National Constitution Center. The prestigious award has been awarded to international leaders from Malala Yousafzai to the Dalai Lama, presidents George Bush and Bill Clinton and other dignitaries and visionaries. The timing of Lewis's award coincided with the 150th anniversary of the 14th amendment. On May 24, 2018, he was Harvard University's Commencement Speaker. As part of the ceremony, Joshuah Campbell performed his song Sing Out March On in his honor. Lewis is portrayed by Stephan James in the 2014 film Selma. He made a cameo appearance in the music video for Young Jeezy's song "My President", which was released in the month of Obama's inauguration. In February 2018, John Lewis voiced his guest character (also called "John Lewis") in the Arthur episode "Arthur Takes a Stand". Walking with the Wind: A Memoir of the Movement by John Lewis with Mike D'Orso, (Harvest Books: 1999) ISBN 0-15-600708-8. The U.S. Congressman tells of life in the trenches of the Civil Rights Movement, the numerous arrests, sit-ins, and marches that led to breaking down the barriers of discrimination in the South during the 1950s and 1960s. John Lewis in the Lead: A Story of the Civil Rights Movement by Jim Haskins and Kathleen Benson, illustrated by Benny Andrews, (Lee & Low Books: 2006) ISBN 978-1-58430-250-6. A biography of John Lewis, one of the "Big Six" leaders who were chairman of activist groups organizing the 1963 March on Washington, focusing on his involvement in Freedom Rides, the March on Washington, and the march across the Edmund Pettus Bridge in the 1965 Selma to Montgomery marches. John Lewis: From Freedom Rider to Congressman by Christine M. Hill, (Enslow Publishers, Inc., 2002) ISBN 0-7660-1768-0. A biography of John Lewis written for juvenile readers. Freedom Riders: John Lewis and Jim Zwerg on the Frontlines of the Civil Rights Movement by Ann Bausum, (National Geographic Society, 2006) ISBN 0-7922-4173-8. Across That Bridge by John Lewis with Brenda Jones, (Hyperion: 2012) ISBN 978-1-4013-2411-7. Winner of the 2013 NAACP Image Award for Outstanding Literary Work/Biography. It is an accessible discussion of Lewis's philosophy and his viewpoint of the philosophical basis of the Civil Rights Movement. March: Book One a 2013 illustrated comic history of Lewis' career, with sequels published in 2015 and 2016, by John Lewis, Andrew Aydin, and Nate Powell, (Top Shelf Productions: 2013) ISBN 978-1-60309-300-2. ^ John Lewis (1998). Walking with the Wind: A Memoir of the Movement. New York: Simon & Schuster. p. 7. ISBN 9780156007085. Retrieved January 1, 2013. ^ a b "My Name Is Freedom Albany, Georgia". You Can't Be Neutral on A Moving Train. Boston: Beacon Press. Archived from the original (reprint) on February 19, 1999. ^ "The Freedom Riders, Then and Now". Smithsonian Magazine. Retrieved July 26, 2012. ^ "Civil Rights Timeline". CNN. January 31, 2006. Archived from the original on August 8, 2012. ^ Minor, Bill (April 2, 2010). "New law meant to eliminate existing 'donut hole'". Editorial. DeSoto Times-Tribune (online ed.). Retrieved February 25, 2019. ^ "Once Race Riot Enemies, Now Friends". ABC News. February 6, 2009. Retrieved August 22, 2010. ^ "Man Asks Entire Town for Forgiveness for Racism". ABCnews.go. February 6, 2009. Retrieved August 22, 2010. ^ "GA District 5 – Special Election Primary Race – Mar 15, 1977". Our Campaigns. Retrieved July 26, 2012. ^ "GA District 5 – Special Election Race – Apr 05, 1977". Our Campaigns. Retrieved July 26, 2012. ^ Lewis, Walking with the Wind, pp. 446–451. ^ "GA District 5 – D Primary Race – Aug 12, 1986". Our Campaigns. Retrieved July 26, 2012. ^ "GA District 5 – D Runoff Race – Sep 02, 1986". Our Campaigns. Retrieved July 26, 2012. ^ Clendinen, Dudley (September 3, 1986). "Ex-Colleague Upsets Julian Bond in Atlanta Congressional Runoff". The New York Times. Retrieved August 16, 2015. ^ Timothy Dwyer (April 15, 1987). "Julian Bond Says He Never Used Cocaine, Blames Wife's Charges on Domestic Rift". philly-archives. Retrieved August 16, 2015. ^ "GA District 5 Race – Nov 04, 1986". Our Campaigns. Retrieved July 26, 2012. ^ "GA District 5 Race – Nov 08, 1994". Our Campaigns. Retrieved July 26, 2012. ^ "GA District 5 – D Primary Race – Jul 21, 1992". Our Campaigns. Retrieved July 26, 2012. ^ "GA District 5 – D Primary Race – Jul 15, 2008". Our Campaigns. Retrieved July 26, 2012. ^ "Issues 2000 Lewis". Issues2000. ^ a b c d "Nonviolent Fighter; John Lewis Retraces the Route That Led to the Future": Carlson, Peter. The Washington Post [Washington, D.C] June 9, 1998: 01. ^ a b c d John Lewis: 'Conscience' carries clout: Civil rights icon's moral authority enhanced: [Main Edition] Kemper, Bob. The Atlanta Journal-Constitution [Atlanta] May 21, 2006: .1. ^ Smith, Asher (April 21, 2008). "The Tuesday Ten: An Interview with Rep. John Lewis". The Emory Wheel. Archived from the original on January 24, 2009. ^ Eric Schmitt and Joseph Kahn (May 25, 2000). "The China trade vote: A Clinton triumph; House, in 237–197 vote, approves normal trade rights for China". The New York Times. Retrieved February 27, 2011. ^ "Social programs: world report. The wreck of the gravy train": Canada and the World Backgrounder 62. 2 (Oct 1996): 3–34. ^ "Shared power, foreign policy, and Haiti, 1994. Public memories of war and race." Goodnight, G. Thomas; Olson, Kathryn M.; Rhetoric & Public Affairs 9. 4 (Winter 2006): 601–634. ^ Felicia R. Lee (August 3, 2002). "War Resisters: 'We Won't Go' To 'We Won't Pay'". The New York Times. Retrieved March 1, 2011. ^ Vanden Heuvel, Katrina (January 2, 2006). "The I-Word is Gaining Ground-UPDATED". The Nation. ^ a b Marina Walker Guevara, "Lobbyists tag along on civil rights tour", The Center for Public Integrity, June 8, 2006. ^ "House Rebukes Obama for Continuing Libyan Mission Without Its Consent". The New York Times. June 4, 2011. ^ "H.Res.292 - Declaring that the President shall not deploy, establish, or maintain the presence of units and members of the United States Armed Forces on the ground in Libya, and for other purposes". www.congress.gov. United States Congress. ^ Merida, Kevin (January 21, 2001). "So Close, So Far: A Texas Democrat's Day Without Sunshine". The Washington Post. The Washington Post Company. Retrieved January 17, 2017. ^ "Tens of Thousands March Against Iraq War" Lichtblau, Eric. New York Times March 16, 2003: 1.15. ^ "Lewis, 6 other lawmakers arrested in embassy protest": Kemper, Bob. The Atlanta Journal-Constitution May 17, 2006: p. 3. ^ "U.S. lawmakers arrested in Darfur protests at Sudan embassy". CNN. April 27, 2009. Retrieved April 27, 2009. ^ "Democratic lawmakers arrested during immigration protest - NBC Politics". Nbcpolitics.nbcnews.com. October 8, 2013. Retrieved November 9, 2013. ^ "'Spirit of History': House Democrats Hold Sit-In on Gun Control". NBC News. Retrieved June 22, 2016. ^ "Rep. Lewis endorses Clinton". CNN Political Ticker. October 12, 2007. Retrieved May 6, 2010. ^ Zeleny, Jeff and Patrick Healy (February 15, 2008). "Black Leader, a Clinton Ally, Tilts to Obama". The New York Times. Representative John Lewis said he planned to cast his vote as a superdelegate for Barack Obama in hopes of preventing a fight at the Democratic convention. ^ Ben Smith (February 15, 2008). "Awaiting Lewis". Politico. Retrieved August 1, 2012. ^ "Lewis switches from Clinton to Obama". CNN Political Ticker. February 27, 2008. Retrieved May 6, 2010. ^ Hearn, Josephine Hearn (June 4, 2008). "Black lawmakers emotional about Obama's success". Politico.com. ^ Hernandez, Raymond (July 1, 2008). "A New Campaign Charge: You Supported Clinton". New York Times. ^ Bumiller, Elisabeth (October 12, 2008). "Congressman Rebukes McCain for Recent Rallies". The New York Times. ^ "John McCain equal to George Wallace? Barack Obama says 'no,' and John Lewis says he's been misunderstood". October 11, 2008. ^ Carter, Lauren. "Rep. John Lewis reflects on the 50th Anniversary of the March on Washington". The Grio. Entertainment Studios LLC. Retrieved September 24, 2016. ^ Bade, Rachael. "Democrats stage sit-in on House floor to force gun vote". Politico. Politico. Retrieved June 23, 2016. ^ McGione, Peggy (June 28, 2016). "For Rep. John Lewis, African American Museum was a recurring dream". ^ Kinnard, Meg (February 13, 2016). "Rep. Lewis softens dismissal of Sanders". Burlington Free Press (online ed.). Burlington, Vermont. Associated Press. Retrieved February 25, 2019. ^ Temple-West, Patrick (February 15, 2016). "Hillary Clinton's secret weapon: John Lewis". Politico.com. Arlington, Virginia. Retrieved February 25, 2019. ^ Todd, Chuck; Bronston, Sally; Rivera, Matt (January 14, 2017). "Rep. John Lewis: 'I don't see Trump as a legitimate president'". NBC News. ^ Nicholas Loffredo, "John Lewis, Questioning Trump's Legitimacy, Among Dems Skipping Inauguration", Newsweek, January 14, 2017. ^ Dawsey, Josh; Cheney, Kyle; Morin, Rebecca (January 14, 2017). "Trump rips John Lewis as Democrats boycott inauguration". Politico. ^ Qiu, Linda (January 15, 2017). "Trump's exaggerated claim that John Lewis' district is 'falling apart' and 'crime infested'". PolitiFact. Retrieved February 7, 2018. ^ Smith, David (January 14, 2017). "Donald Trump starts MLK weekend by attacking civil rights hero John Lewis". The Guardian. Retrieved January 15, 2017. ^ "Trump maintains feud with Lewis: He also boycotted Bush 43". POLITICO. Retrieved August 6, 2018. ^ Post Editorial Board (January 18, 2017). "Trump should shrug off John Lewis' cookie-cutter insults". Editorial. New York Post. New York City. Retrieved February 25, 2019. ^ "Democratic congressman John Lewis rejects Trump, will skip inauguration for first time in 30 years". Global News. Retrieved February 7, 2018. ^ "Trump inauguration boycott grows". BBC News. 2017. Retrieved February 7, 2018. ^ Jacobson, Lewis. "John Lewis wrong on whether he has skipped an inauguration". PolitiFact. Retrieved February 7, 2018. ^ "Caucus Members". Congressional Progressive Caucus. Retrieved January 30, 2018. ^ "Members". Afterschool Alliance. Retrieved April 17, 2018. ^ "Our Members". U.S. House of Representatives International Conservation Caucus. Retrieved August 14, 2018. ^ "Black Americans in Party Leadership Positions, 1977–present | US House of Representatives: History, Art & Archives". history.house.gov. Retrieved January 26, 2017. ^ "Across That Bridge: Life Lessons and a Vision for Change" (review), Publishers Weekly, March 5, 2012. ^ Cavna, Michael (August 12, 2013). "In the graphic novel 'March,' Rep. John Lewis renders a powerful civil rights memoir". The Washington Post. Archived from the original on October 29, 2013. Retrieved October 25, 2013. ^ Lewis, John; Aydin, Andrew (August 2, 2016). "March: Book Three". Top Shelf Productions. Retrieved August 24, 2016 – via Amazon. ^ "U.S. Rep. John Lewis Discusses His Graphic Novel "March"". September 8, 2014. ^ "Best Sellers - The New York Times". Retrieved February 8, 2014. ^ "Coretta Scott King Book Awards - All Recipients, 1970–present". American Library Association. Retrieved December 4, 2014. ^ MacDonald, Heidi (March 21, 2014). "March Book One is first graphic novel to win the RFK Book Award". Comics Beat. ^ "About the Book". City of East Lansing & Michigan State University. Archived from the original on January 12, 2015. Retrieved December 14, 2014. ^ "Fall 2014 Selection". Georgia State University. Archived from the original on December 20, 2014. Retrieved December 4, 2014. ^ "About the Book". Marquette University, Office of Student Development. Retrieved December 4, 2014. ^ "Paperback Graphic Books". The New York Times. Retrieved November 4, 2016. ^ Michael Cavna (November 17, 2016). "Rep. John Lewis's National Book Award win is a milestone moment for graphic novels". The Washington Post. ^ ""American Library Association announces 2017 youth media award winners"". American Library Association. Retrieved January 23, 2017. ^ "Carter G. Woodson Book Award and Honor Winners". Silver Spring, Maryland: National Council for the Social Studies. Retrieved February 25, 2019. ^ Rappaport, Michael (April 11, 2018). "'Run' Follows Award-Winning Graphic Novel 'March' in Civil-Rights Chronicle". Wall Street Journal. Retrieved April 12, 2018. ^ Daniel Malloy (December 31, 2012). "Rep. John Lewis' wife, Lillian, dies". Blogs.ajc.com. Retrieved November 9, 2013. ^ "President Clinton Inducted into Phi Beta Sigma Fraternity". Reuters. Archived from the original on March 15, 2013. Retrieved January 1, 2013. ^ "John Lewis - John F. Kennedy Presidential Library & Museum". Retrieved December 8, 2012. ^ "NAACP Spingarn Medal". Archived from the original on May 5, 2014. Retrieved April 19, 2017. ^ "National Winners | public service awards". Jefferson Awards.org. Retrieved November 9, 2013. ^ "Civil Rights Movement Pioneer to receive Dole Leadership Prize". Robert J. Dole Institute of Politics, University of Kansas. September 26, 2007. Archived from the original on December 7, 2008. Retrieved October 12, 2008. ^ Remnick, David (February 2, 2009). "The President's Hero". The New Yorker. ^ "Rep. John Lewis Honored as Civil Rights Champion with First LBJ Liberty and Justice for All Award". Retrieved April 3, 2012. ^ Goldman, Julianna (February 15, 2011). "Obama Honors Buffett, George H.W. Bush With Medal of Freedom". Bloomberg. Retrieved February 15, 2011. ^ a b "Civil Rights leader Rep. John Lewis to deliver 2016 Commencement address, joining honorands Lisa Genova '92, Daniel Gilbert and Robert Witt '62". bates.edu. Retrieved May 20, 2016. ^ "Commencement Program, 1999". Open Archives: Digital Collections at the University of Massachusetts Boston. University of Massachusetts Boston. Retrieved May 26, 2017. ^ "Simmons among nine honorary degree recipients". Brown University. May 16, 2012. Retrieved May 28, 2014. ^ "Penn's 2012 Commencement Speaker and Honorary Degree Recipients". Penn Almanac. University of Pennsylvania. Retrieved January 28, 2016. ^ a b "Harvard awards seven honorary degrees". Harvard Gazette. May 24, 2018. Retrieved August 6, 2018. ^ "U. S. Rep. John Lewis to be Honored at Judson College". Perry County Chamber of Commerce. February 21, 2013. Retrieved November 5, 2016. ^ "John Lewis Receives Honorary Doctorate from CSU". Cleveland State University. December 16, 2013. Retrieved July 22, 2015. ^ "Civil rights advocate U.S. Rep. John Lewis urges graduates to "get in the way" - Union College". June 16, 2013. Retrieved November 22, 2015. ^ "Honorary degree recipients are leaders in education and civil rights". Emory News Center. May 7, 2014. Retrieved July 22, 2015. ^ "Speaker: Rep. John Lewis". May 20, 2015. Retrieved March 20, 2017. ^ "2015 Commencement Speakers Announced". The Hoya. May 4, 2015. Retrieved May 14, 2015. ^ "Darren Walker, Ford Foundation President, to Speak at NYU’s Commencement", NYU, March 10, 2016. ^ "John Lewis", Commencement, Washington University in St. Louis. ^ "Pardee RAND Graduate School Commencement", Pardee RAND Graduate School, June 18, 2016. ^ "Yale awards honorary degrees to eight individuals for their achievements". Yale News. Yale University. May 18, 2017. Retrieved May 22, 2017. From Freedom Rider to statesman, you have championed civil rights and public service for six decades. You have faced beatings, violence, and intimidation with steadfast nonviolence... Devoted champion of America and of all of its people, in recognition of a lifetime of bold action and inspiring results, we are honored to present you with this Doctor of Laws degree. ^ "John Lewis to receive 2016 Liberty Medal", National Constitution Center, June 2, 2016. ^ "John Lewis honored with the Liberty Medal", Philly.com, September 20, 2016. ^ Alexander, Brian (June 5, 2018). "Harvard Students Deliver Rousing Musical Tribute at 2018 Commencement Program". College A Cappella. Retrieved December 16, 2018. ^ "Office of the House Clerk – Electoral Statistics". Clerk of the United States House of Representatives. Archived from the original on July 30, 2008. ^ "Election Results". Federal Election Commission. ^ "General Election -- November 6, 2012". Secretary of State of Georgia. November 21, 2012. Retrieved August 5, 2013. ^ "General Election -- November 4, 2014". Secretary of State of Georgia. November 10, 2014. Retrieved November 12, 2015. ^ "GA - Election Results". December 1, 2016. Retrieved May 27, 2017. ^ "Young Jeezy - My President ft. Nas". YouTube. From 3'17" to 3'19" in. ^ Soderberg, Brandon 9February 18, 2009). "Music Video Round-Up: Young Jeezy's 'My President Is Black' & Relics of Cynicism". Slant Magazine. Accessed January 20, 2017. 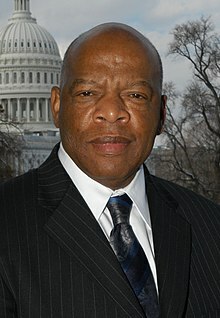 Wikimedia Commons has media related to John Lewis (American politician). John Lewis debates the Defense of Marriage Act (DOMA), June 11, 1996. This page was last edited on 13 April 2019, at 16:15 (UTC).